Is there a way to remove and replace the fuel pump on a Virage TXi without pulling the engine? and what needs to be done? yes the fuel pump is in the gas tank. my question is can you sneak it out thru the fron cargo area or do you need to pull the engine. You can get the pump out of the cargo area. I just barely did this on a 2001 Virage TXi. Start by removing the fuel filler neck from the top of the tank. You'll also need to remove the front tank stopper (Item 23 & 24 in ZMANN's diagram) and then remove the rubber tank hold-down straps too. Next, unhook the fuel lines on top of the motor. Then, unhook the electrical connection on top of the tank. The tank will then move forward enough for you to unscrew the top of the sending unit assembly and then you can lift the whole unit out. It takes a little time but really isn't very hard. Last edited by kejasi; 07-03-2007 at 02:51 PM. Cool, very nice to know. You can get the pump out of the cargo area. I just barely did this on a 2001 Virage TXi. Start by removing the fuel filler neck from the top of the tank. You'll also need to remove the front tank stopper (Item 23 & 24 in ZMANN's diagram) and then remove the rubber tank hold-down straps too. Next, unhook the fuel lines on top of the motor. Then, unhook the electrical connection on top of the tank. The tank will then move forward enough for you to unscrew the top of the sending unit assembly and then you can lift the whole unit out. It takes a little time but really isn't very hard. I forget whether the Virage Ficht fuel tank will slide forward under the EMM bracket or whether it is necessary to first remove the EMM bracket. The fuel tank itself can slide forward and twist just enough to remove the Ficht fuel pump, but the tank cannot be removed through the front hull storage opening, at least not intact. 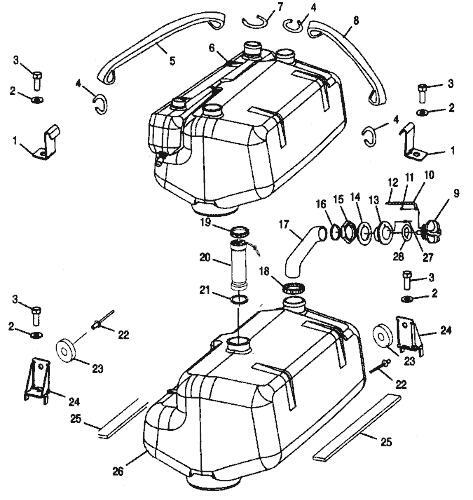 Not mentioned above, the oil tank must be lifted up (disconnect oil filler hose, cap oil tank opening) and slides rearwards as the fuel tank moves forwards. And the manual reverse lever mechanism may need to be removed. HOW-TO: Remove and Replace starter in under 30 minutes!